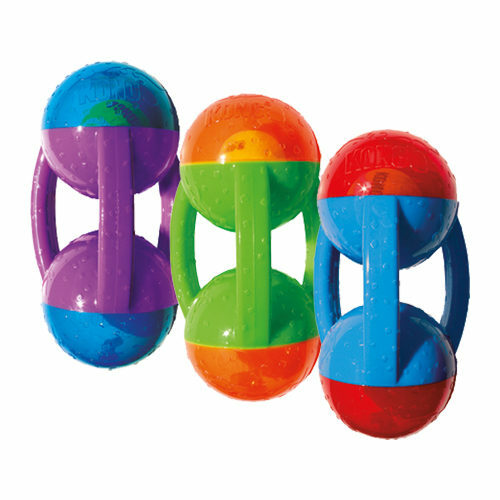 KONG Jumbler Tri is a fun and challenging toy for your trusty pet. These toys contain two tennis balls that ensure that your dog can keep focusing on the toy. Thanks to the useful handles, you can easily pick the toy up and throw it away. These dog toys therefore guarantee lots of (fetching) fun. Your dog will find the KONG Jumbler Tri very entertaining. This toy contains two tennis balls, so your dog will want to keep playing. Thanks to the useful handles, this toy is very suitable for fun fetching and tugging games. KONG has many more fun toys for your dog. View the entire KONG range here! The KONG Jumbler Tri is delivered at random, you cannot select your colour. Have you used KONG Jumbler Tri before? Let us know what you think about this product.